"I love to save money, especially with my big family. So making my own jams and jellies is a favorite hobby of mine to share with my kids. This jam is not only fun to make, but it is also very delicious. There's nothing like your own fresh jam on toasted Italian bread." Mix apricots and lemon juice in a large pot; add sugar. Slowly bring to a boil, stirring until sugar dissolves. Cook and stir until apricot mixture thickens, about 25 minutes. Remove from heat and skim foam if necessary. Meanwhile, prepare jars, lids, and rings by cleaning and sterilizing in dishwasher or boiling water bath. Leave lids in simmering water until ready to seal jars. Ladle hot jam into hot sterilized jars, leaving about 1/4 inch of space on top. Run a knife or a thin spatula around the insides of the jars after they have been filled to remove any air bubbles. Wipe the rims of the jars with a moist paper towel to remove any food residue. Top with lids and screw on rings. Place a rack in the bottom of a large stockpot and fill halfway with water. Bring to a boil, then carefully lower the jars into the pot using a holder. Leave a 2-inch space between the jars. Pour in more boiling water if necessary until the water level is at least 1 inch above the tops of the jars. Bring the water to a full boil, cover the pot, and process for 15 minutes. 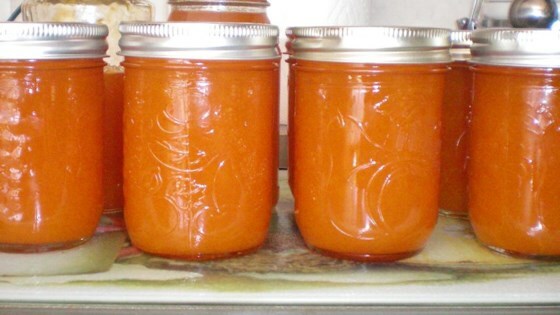 I have made apricot jam many times AND this recipe as written is delicious and easy to make. I give it a 5 star rating. This was so easy to make and I found something to do with all of my fresh apricots! It's the first jam I made so thanks for the simple yet delicious recipe. Great recipe ! I threw in half a jalapeño to add a little kick! Cut the recipe in half and it made three jars. I left the skins on. Gave the jam a little more texture. It’s very good. I just got a thumbs up from my trucker son! !